Looking for the perfect vegan banana muffin recipe? Look no farther, you've found it! Banana muffins are a very easy muffin for vegans to make because the banana can act as a binder and provide moisture which is what eggs typically provide. Since you don't need eggs or even egg replacer, it makes recipes such as this one perfect for anyone new to vegan baking (or new to baking in general), or anyone who is just hesitant to try something new. 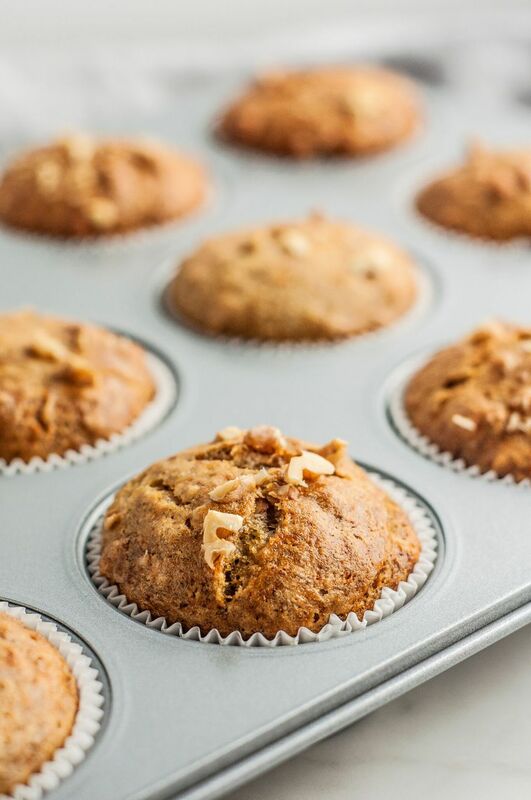 So, why not give this easy-peasy vegan banana nut muffin recipe a whirl? Try them warm from the oven with a slathering of vegan butter or wait until they're cool and pop one into a lunchbox (yours, the hubby's, or the kids'). Heat the oven to 360 F and prepare a 12-cup muffin tin by either lining or lightly coating it with nonstick spray (coconut oil spray is a good choice when making muffins). In a large bowl, mash the bananas with a fork till soft. Add the oil or vegan margarine and sugar and then cream them both together. In a separate bowl, combine the flour, salt, and baking soda until well mixed. Combine this flour mixture with the banana mixture, stirring gently just to combine. Don't over mix. If you're using the optional walnuts, now is the time to gently fold them in. Alternatively, you can sprinkle them on top of each individual muffin before baking. Next, carefully spoon the batter into your lightly greased or lined muffin tin, filling each well about 2/3 full. If desired, sprinkle the optional sugar on top just before baking. Bake the muffins in the heated oven for about 25 minutes, or until a toothpick inserted into a muffin comes out clean. Eat while still warm or cool completely for longer storage. While most baked goods are at their best when fresh, these muffins can be stored at room temperature in a covered container for two or possibly three days and still be quite tasty. For longer storage, place them in a covered container in the refrigerator for up to one week. The texture will have hardened but you can revive them by heating in a microwave for 20 to 30 seconds. For really longer storage, store them in layers separated by waxed or parchment paper in a cover container and freeze for up to six months. Defrost them at room temperature in the covered container. Or remove one at a time and defrost by zapping in the microwave. If you have unripened bananas and need to ripen them fast, you can put the unpeeled bananas on a foil-lined baking sheet. Bake at 350 F for 15 to 20 minutes, or until the bananas are completely blackened. Let them cool, scoop the banana from the peel, and mash for banana bread. The microwave oven is another way to ripen bananas. For this method, peel the bananas and place them on a microwave-safe plate or bowl. Heat just until you hear them sizzling, about 30 seconds. If you've got overripe bananas going bad in your kitchen, another easy way to use them up quickly and deliciously is with this 4-star vegan banana cake recipe or try these vegan banana-coconut muffins. Like making homemade vegan muffins? Here are more vegan muffin recipes to try. Or, If you're not sure what a vegan is, you'll want to check out this simple vegan definition, and if you're looking for more vegan recipes in general, these should fill the bill.